Welcome to Island Time, your floating home away from home,in the Caribbean. Come and start your dream vacation. Whether it’s walking on a sandy beach, snorkeling or diving the reefs, having a drink and enjoying music at Foxy’s or Cane Garden Bay, sailing to Anegada for a lobster dinner, or just enjoying a tropical Caribbean sunset on a sailing yacht, with good friends. 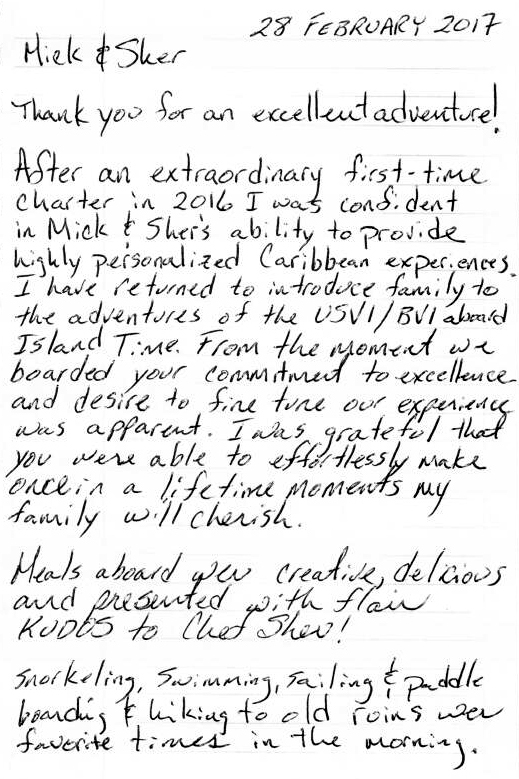 There is lots to do and see in this beautiful area, and all of our trips are custom tailored, to best fit what you would like to enjoy during your time in the British Virgin Islands. At the helm, sails hoisted! 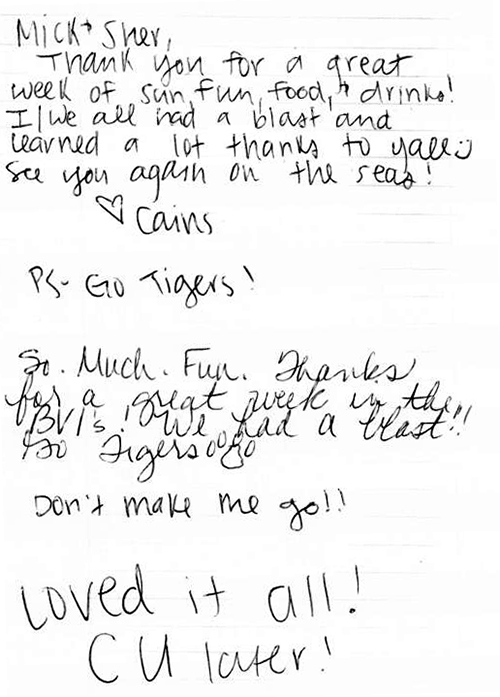 Mick, your Captain, grew up in a boating family in Southern California. He started water skiing and sailing at a young age. He started operating charter boats in 1990, running boats that did whale watching trips,diving trips and fishing trips out the San Francisco, California area. 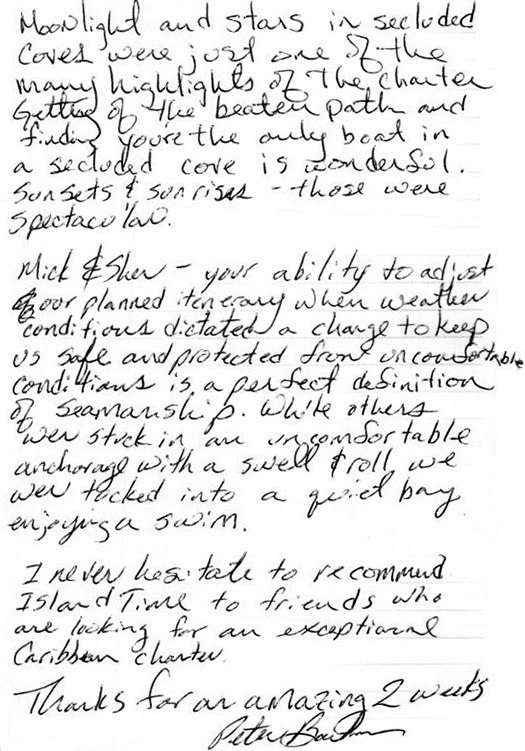 In the late 1990’s, he added sailing trips in the same area. He later started sailing down the California coast, and along the Pacific coast of Mexico, including the Sea of Cortez. He was introduced to the Bahamas, and the Caribbean about the same time. Before long, the Caribbean had a hold of him, and he started sailing seasonally in St Lucia, the Virgin Islands, and around the Bahamas, in addition to three seasons in Mexico. He finally sold his boats on the west coast, and is now able to sail in the Virgin Islands year round. As may be apparent, Mick’s passion is boats, and showing people new and exciting things on, under and around the waters of a beautiful area. Sher, your 1st Mate & Chef, has a wealth of experience on charter boats having worked sailing, motor and diving charter vessels. She is originally from the Sierra Nevada Mountains in California, but loves the sea. She is an Air Force Veteran and is very well traveled having lived in Europe, South America and the Caribbean and traveled far beyond. She now makes the water her home on S/Y Island Time! Sher looks forward to ensuring her guests have a wonderful experience in all areas of their holiday: sailing, exploring the gorgeous island beaches, snorkeling, paddle boarding and other water sports, relaxing with island beverages, learning about the beautiful islands and more! To add to their experiences, she serves a delicious array of meals, snacks and beverages! Island Time, a spacious 46 foot Robertson & Caine Catamaran,can comfortably and easily accommodate up to 6 guests in three cabins. Each cabin has a queen size bed, small closet and clothes storage area, and its own shower and toilet. The showers are each enclosed, so that the sinks and toilets stay dry. The crew has a separate cabin, with its own shower and toilet. Island Time is fully air conditioned thru out, with separate thermostats for the saloon and cabin areas. Coffee, tea and fruit juices available with every breakfast. Coconut French Toast topped with toasted coconut and whipped cream served with butter and syrup accompanied by breakfast sausage and fruit of the day. Frittata del Giorno and toast served with jams and butter accompanied by the fruit of the day. Pancakes served with a sweet delicious banana topping accompanied by bacon or sausage and fruit of the day. Eggs Benedict: poached eggs served on English Muffins & ham topped by a freshly made Hollandaise sauce served with a slice of tomato and fruit of the day. Continental Breakfast including mini croissants, yogurt, a variety of toasted bread, fruit plate, cereals, jams and hard cooked eggs. Lox and Bagels, smoked salmon served with toasted bagels, cream cheese, chopped red onion, & capers accompanied by fruit of the day. Ham and egg cups served with toast, jams and fresh fruit. Spinach Onion Quiche and garden salad served with fresh bread. Green Curry Coconut Shrimp with vegetables served over a bed of vermicelli rice noodles. BLTA: bacon, lettuce, tomato & avocado sandwiches served on a baguette accompanied by chips and fruit. Asian Calamari Salad served on a bed of greens accompanied by fresh bread. Wrapsodia: wraps filled with pastrami, cheese and garden vegetables accompanied by fresh fruit.Tacos with all the trimmings accompanied by chips and salsa. Crab Cakes served on a bed of greens served with a cup of homemade butternut coconut squash soup accompanied by fresh bread. Island Chicken Roti accompanied by chutneys served with a garden salad. Nicoise salad accompanied by fresh bread. Assorted cheeses plate served crispy sliced apples and crackers. Chilled shrimp served with a cocktail sauce and fruit. Fresh made hummus served with crisp vegetables, crackers and olives.Pesto pizza topped with feta cheese, olives and basil. Charcuterie plate served with breads, crackers, nuts and fruit.Warm brie topped with honey & walnuts served with fresh crispy apple slices and crackers. Tortilla española accompanied by aioli sauce and fruit. Warm Mexican bean dip topped with melted cheese served with chips, salsa and vegetable sticks. Grilled Steak served with a cream mustard sauce accompanied by a baked potato and stir fried broccoli, onions with garlic and fresh bread. Oven baked Mahi Mahi topped with sweet red peppers, yellow squash & onions served on a bed of coconut rice accompanied by a garden salad and fresh bread. Grilled marinated pork tenderloin topped with a mango sauce served with baked small red potatoes and a garden salad and fresh bread. Poached herbed grouper served on a bed of garlic herb couscous with a garden salad and fresh bread. Grill seared tuna steaks served with wasabi & soy sauce accompanied by basmati rice and a garden salad. Roasted marinated chicken breast served on a bed of orzo topped with a cream mushroom sauce accompanied by a fresh cooked Brussels sprouts and fresh bread. Fettuccine Alfredo with shrimp or chicken served with a green salad. Grilled Salmon topped with a lemon caper sauce served over a bed of jasmine rice accompanied by a garden salad and fresh bread. Coffee and tea available every evening. Key Lime pie topped with whipped cream.Pear torte. Fudge brownies topped with whipped cream and cocoa.New York style cheesecake.Coconut Pie topped with whipped cream. Fresh berry & kiwi fruit cup bathed in orange juice served with shortbread. Bananas Foster served over fresh baked pound cake. Island Time was everything (and then some) that we could have asked for! 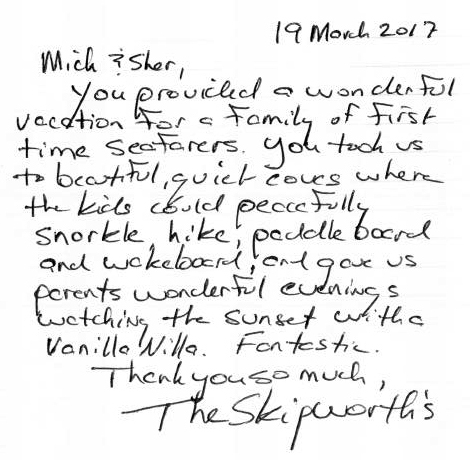 Mick and Sher were delightful, his captaining of the boat was superb, her cooking was off the charts sensational, their host/hostessing was perfect – we all gave it 5 stars! The St. Martin/St. Bart’s areas were beautiful – we got to snorkel with tortoises and sea rays and saw the green flash at sunset on our last night! 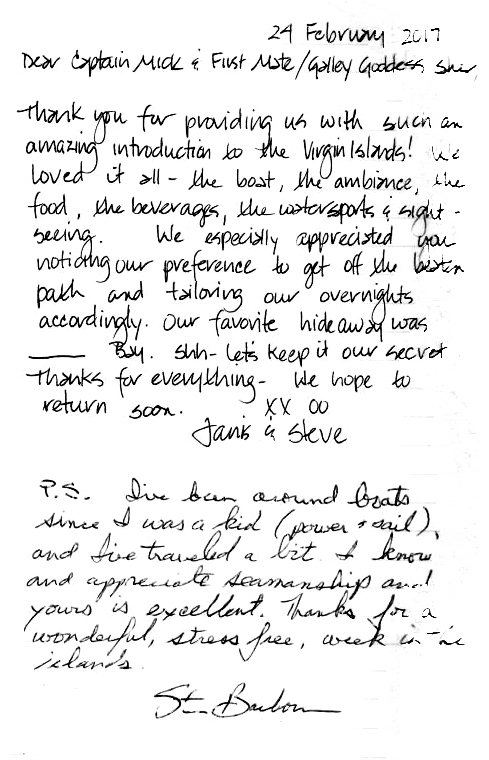 I can’t say enough about what a great time we had – thanks for putting us together with them. Mick and Sher made it incredibly convenient for us, picking us up at the dock, despite a late arrival and getting us out on the water quickly. Our accommodations were wonderful. We had more space than we expected. The beds were comfortable; we were provided with attractive and clean towels. The meals were fantastic. I remain amazed that Sher was able to create such good food in the galley. At every meal we had heathly, tasty meals, plenty of quantity, and variety throughout the trip. In particular, we had one member of our party with a wheat allergy. Sher prepared special meals for that person that were better than he gets at home. It was clear she put real thought into preparing meals without wheat that would still be delicious. • Was the crew friendly and accommodating? • Was the yacht comfortable and clean? The yacht was perfect - everything was in top shape. • Was the yacht well ventilated? • Was the food good and well presented? OUTSTANDING!!! Sher exceeded our expectations 4 times every day. • Did you like the area you sailed? Awesome! We were playing and waking up in National Parks ... or better! • Additional comments on your charter? Mick Menigoz and Sher Turner were outstanding. Since Mick owns his own boat, he knows it and takes care of it better than your typical captain-for- hire. Their local knowledge coupled with knowing their boat can enhance your cruise by going to cooler places and/or doing different things than you could otherwise. Sher's attention to detail, energy, and hard work make her absolutely the BEST. Her food was OUTSTANDING, and the presentations were terrific. We kept thinking "this must be a special meal", but then every meal kept on getting better and better. They work hard to make sure your group gets to do anything and everything you can think of. You can talk to them about things you like and don't like, and their experience and local knowledge help them suggest the perfect time and place just for you. You can really come up with your ideal day, ideal week, or any special occasion - and they will work together to make it happen and exceed your expectations.